The June update for Developer Preview is now live! We’ve had a month with new features and a lot of time spent on improving quality, especially trying to iron out the bugs you have submitted to us via https://github.com/Microsoft/AL/issues. Thanks again to everyone who has contributed and, please keep that feedback coming. In the in-app designer you can now reposition or hide a Cue tile or Cue Group on any page by using the jewel menu. We’ve focused on making the boundary between the in-app designer and Visual Studio Code smoother. Pressing F6 in Visual Studio Code will open the current extension and allow you to add more changes using the in-app designer. For example, start in VS Code, define a page extension, press F6 to open the web client, then use the in-app designer to move the fields around and finally save your extension to files. Pressing F7 in Visual Studio Code to pull changes made by the in-app designer and add them as code back into your source. For example, start in VS Code, write a page extension, press F6, and move fields. Then switch back to VS Code and press F7. The new field order will update in the source code. Copyright (C) 2017 Copyright (c) Microsoft Corporation. All rights reserved. Required. The path of the directory containing the TXT files. Required. The path of the directory into which the converted AL files will be placed. Rename the output files to prevent clashes with the source .txt files. The starting numeric ID of the extension objects (Default: 70000000). It will be incremented by 1 for each extension object. You can now include translation files and table data files in Extensions V2. To include a language, include the TXT file in the project directory. Press F5 will generate a .navx package that includes the captions. Note, that you can export captions using the following cmdlet https://msdn.microsoft.com/en-us/dynamics-nav/microsoft.dynamics.nav.model.tools/export-navapplicationobjectlanguage. The same approach goes for data and you can use this cmdlet https://msdn.microsoft.com/en-us/dynamics-nav/microsoft.dynamics.nav.management/export-navdata to export your data to file and then include in the .navx package. 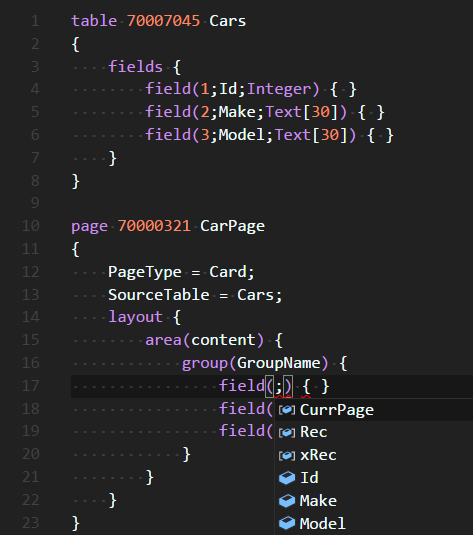 When coding the page fields, use the snippet tfieldpage, then position your cursor as shown and invoke IntelliSense (Ctrl+Space) to choose which field to populate. With this update, we introduce the system capability to define tenant-specific profiles. This has been one of the most requested features by partners who create extensions. You’ll be able to use full capability of this feature in upcoming developer preview when we deliver compiler support to define a new tenant-specific profile directly in AL code. This update delivers only the underlying platform capability enabling extensions to define profiles. As a consequence of adding this feature we expanded the UI around Profile creation and selection to differentiate system-wide profiles from tenant-specific profiles. Now the page which is listing profiles identifies profile scope which is either System or Tenant. Additionally, in case a profile is introduced when installing an extension, you’ll be able to see the extension name on that list. The profile card has been changed in similar way. Now you must choose the scope of new profile depending on a need to create a profile which is common for all tenants or tenant-specific. Note: in Dynamics 365 for Financials the System option isn’t available – a tenant administrator is not able to create System profiles, which would be shared with other tenants. The only option is to create a tenant-specific profile. Stay tuned until the next update when you will be able to fully use this feature in your extensions. Highly requested virtual tables are now available: User, Field, AllObj, AllObjWithCaption etc. Powershell cmdlet support for exporting objects into new syntax. Let us know how you like working with these additions and keep submitting suggestions and bugs. You can see all the filed bugs on our GitHub issues list (https://github.com/Microsoft/AL/issues). To get an updated image you can see the steps for getting it in the original blog post or jump directly to the Azure Gallery signup at http://aka.ms/navdeveloperpreview. For a list of our previous blog posts, see the links at the end of this post. Thanks again and see you with a big announcement soon!